1 of 5 Heat oven to 350 degrees. 2 of 5 Place butter and sugar in the bowl of an electric mixer fitted with the paddle attachment and mix on medium speed just until combined. With mixer on low, add vanilla. 3 of 5 Sift flour and salt together and, with mixer on low, slowly add to butter mixture, mixing until it almost comes together in a ball. 4 of 5 Turn dough out on a board. Lightly pat two-thirds of the dough evenly on the bottom of a 9-inch square baking pan and about 1/2 inch up the sides. Spread with jam, leaving a 1/2-inch border. Mix granola into remaining dough with your hands. 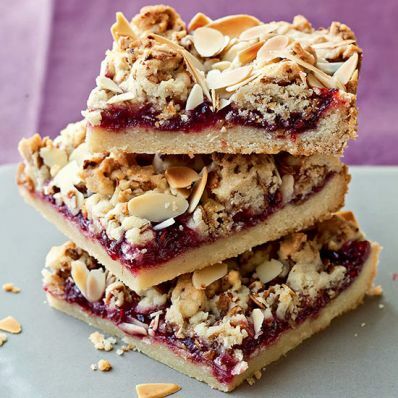 Break dough into small bits and distribute it on top of jam, covering most of the surface. Sprinkle almonds on top. Bake bars at 350 degrees for 45 minutes, until lightly browned. 5 of 5 Cool completely and cut into 9 or 12 bars. Sprinkle lightly with confectioners' sugar.